Grandma Mina's time-traveling carpet sends Scarlett and Sam to ancient Jerusalem. While there, they meet some very important people—the prophet Nathan, the warrior Benayahu ben Yehoiad, and even wise King Solomon—who need their help. eBooks/audio eBooks available from your favorite retailers. Learn more. "Twins Scarlett and Sam are off on another adventure; this time, their destination is King Solomon's kingdom. They arrive to find the young king with no money and a dictum from God to build a temple. Despite Solomon’s reputed wisdom for solving all problems, building the temple seems impossible. It has to be built without iron, which is considered a tool of war. Without iron, who will be strong enough to cut the giant stones and install them in the necessary places? Nathan, the prophet, appears on the scene ready to receive messages from God that can help Solomon. Unfortunately, his visions are murky and Scarlett and Sam must use their ingenuity to interpret them. 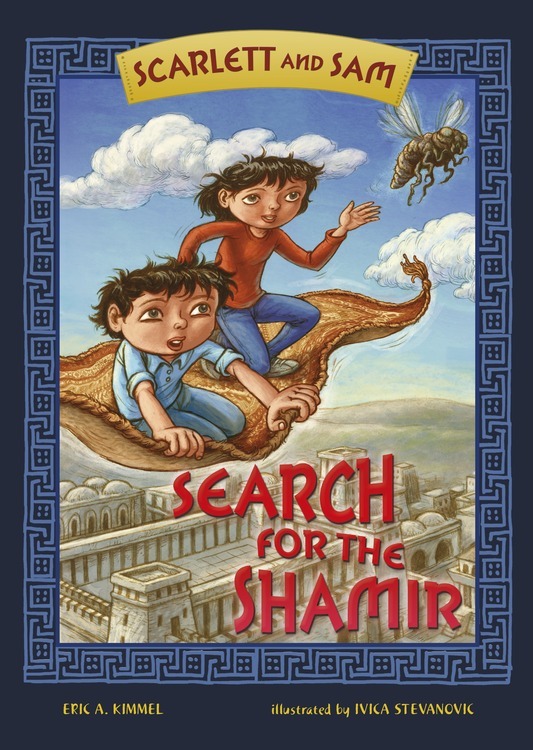 The twins, Solomon, and Nathan work as a team and discover that finding the shamir, a one-of-a-kind insect that can cut stone, will solve their problem. Nathan's vision assures them that Ashmodai, king of the demons, has the shamir. The time-traveling twins’ courage, initiative, and dedication make them uniquely suited to help wrest the shamir from this unwilling demon. Copyright Kar-Ben Publishing - www.karben.com. All Rights Reserved. eCommerce Software by 3dcart.